7 Kids and Us: I Love Oriental Trading for Thanksgiving! I Love Oriental Trading for Thanksgiving! Thanksgiving is definitely one of my favorite holidays. Although we have a small family, we really enjoy the preparations, and that Thanksgiving is always reminding me of all the fall things I love. 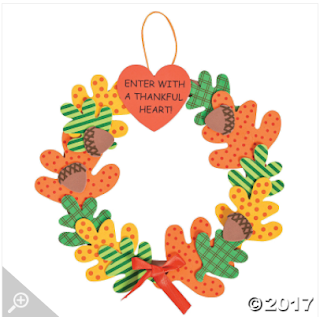 This year was so much fun because I did some crafts with the kids, and we had some neat Thanksgiving themed items that we got from Oriental Trading. Here are my favorites! This was so much fun to make with the kids! Each one had a different design because the leaves can be placed any way you like. This foam decoration is perfect to hang near your entryway! Includes self-adhesive pieces and nylon ribbon. 9 1/2". All craft kit pieces are pre-packaged for individual use. Kits include instructions and extra pieces. 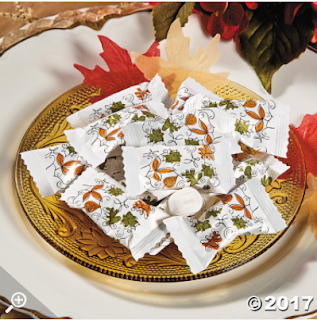 I put a plate of these out a few days before Thanksgiving and the kids were really excited! They loved the falling leaves on the packages, and they are really tasty too! This is by far my favorite item. It's not Thanksgiving themed, but we definitely had a lot of fun with Thanksgiving crafts using it! I had the kids make pumpkins and turkeys and we made hand prints and rolled out their names. So much fun for any holiday! Oh, the things they'll create with Crayola® Model Magic® Classpack®! 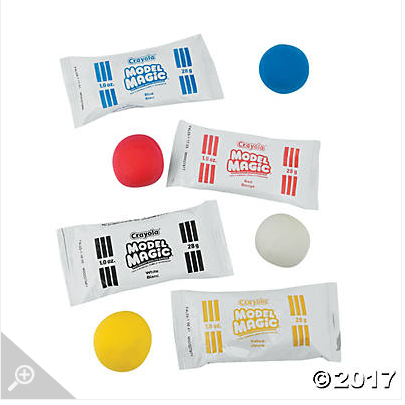 Kids can't get enough of this non-staining, lightweight modeling material. It's soft and easily molded for hours of artistic fun. Teachers love this modeling compound thanks to its air-dry feature - no oven is needed to harden it! Includes the colors red, yellow, blue and white. Safe and non-toxic. $44.99 for a huge box of 75 pouches! I love these kits! The kids had a blast making them, so easy to do too, just grab a stick of glue and you are good to go! Our Turkey Craft Kit for kids is a wonderful way to get the whole family into the spirit of the holiday! This DIY Thanksgiving craft is perfect for family quality time at home, or add it to your classroom supplies and discuss the story of the first Thanksgiving with your students as they keep their hands busy with these terrific turkeys. 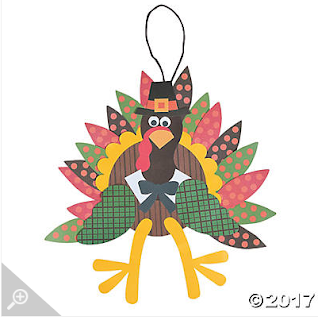 The finished products make great Thanksgiving decorations for the family dining room or school cafeteria. Happy Turkey Day! Saving Christmas Available on DVD 11/21!